The ExpressAR™ device is a durable, reusable precision instrument that can be cleaned for reuse. When deploying ExpressAR, a sterile, disposable Disc and a non-sterile disposable Belt are used and attached to the device. The Disc and Belt come packaged in a belt kit assembly. 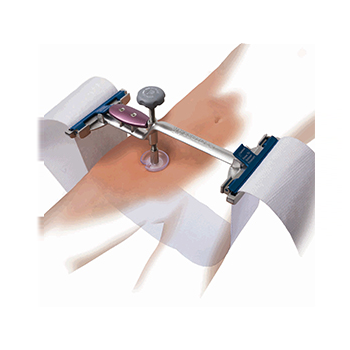 The ExpressAR™ System is used to provide pressure hemostasis after the removal of arterial catheters following femoral catheterization procedures. ExpressAR is positioned prior to removal of femoral catheters and apply controlled pressure to the puncture site until hemostasis is complete.